As we come to end of January, I hope that 2017 has been treating you well so far. This year I did not have a specific New Year’s resolution, instead I set out to change up my tried and true dinner meals and make dinner a little more interesting. I went on Pinterest and began searching for new recipes. Some were flops, and some we liked. I am still a work in progress searching for new meals, but once in awhile you just have to stop and go back to an old favorite. To me,that would be macaroni. You could say that is my number one comfort food. Not only macaroni and cheese but long fusilli with a meat sauce, spinach fettuccine, Pastosa ravioli with mom’s Sunday sauce, and yes, the childhood favorite of pastina with butter and cheese. You have guessed by now that I love my carbs. 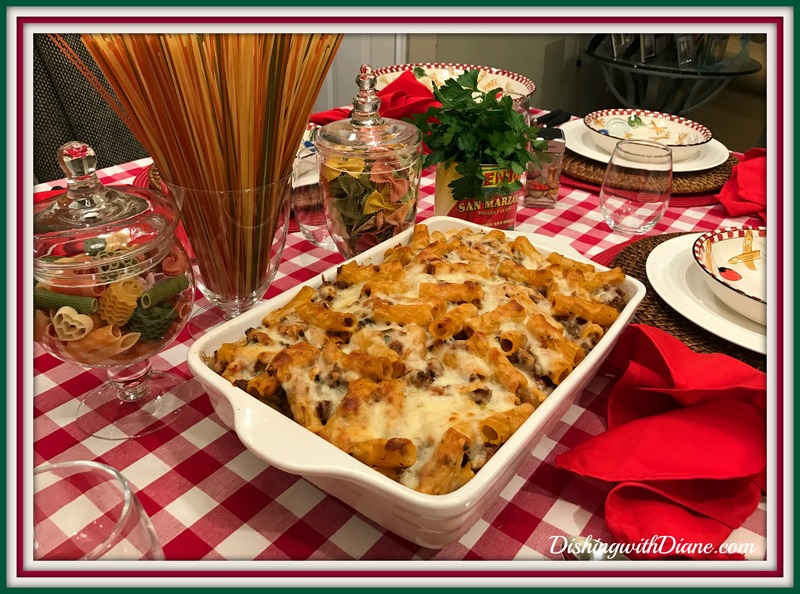 One of the easiest dishes I make that is a family favorite comfort food is “Baked Rigatoni”. 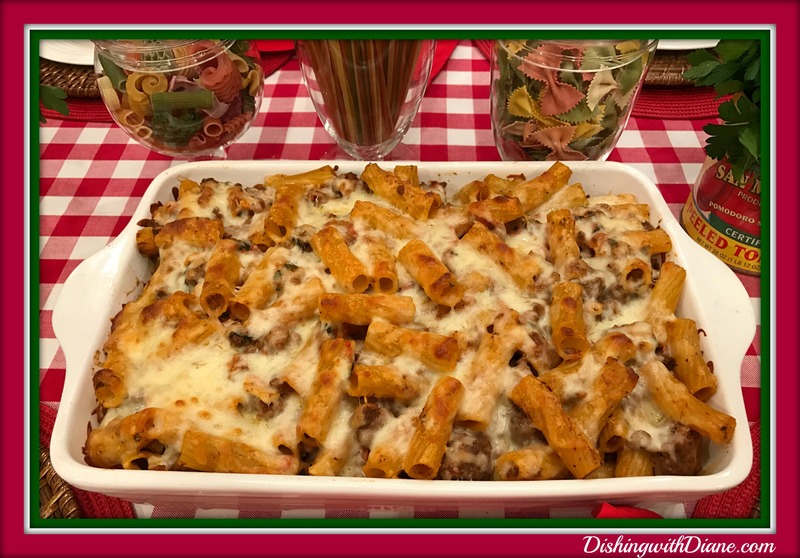 My baked rigatoni has been requested for many a potluck and it was a favorite of my son and his friends back in the day. So “baked rigatoni” it is. Quick and delicious and the crispy pieces of rigatoni baked on top covered in mozzarella cheese are the best. So now that I have my entree, lets work on the tablescape. Something that makes you think, Italian. 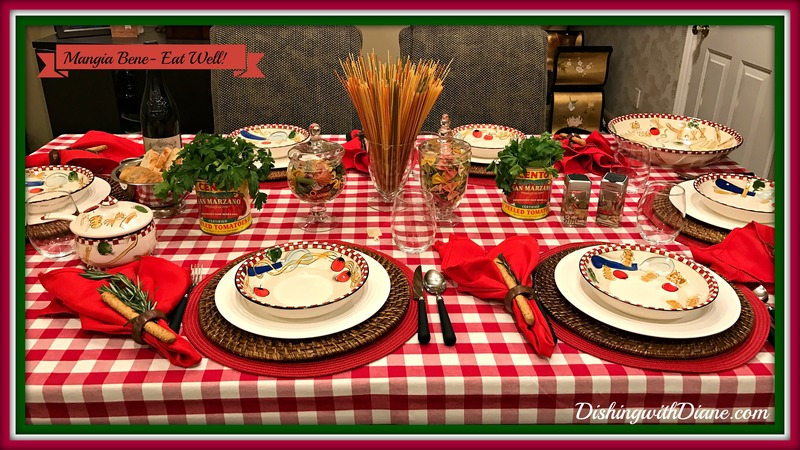 I am starting with a red and white check tablecloth. A lot of people associate this tablecloth with a small Italian cafe. The napkins are solid red and the napkin rings are wood. 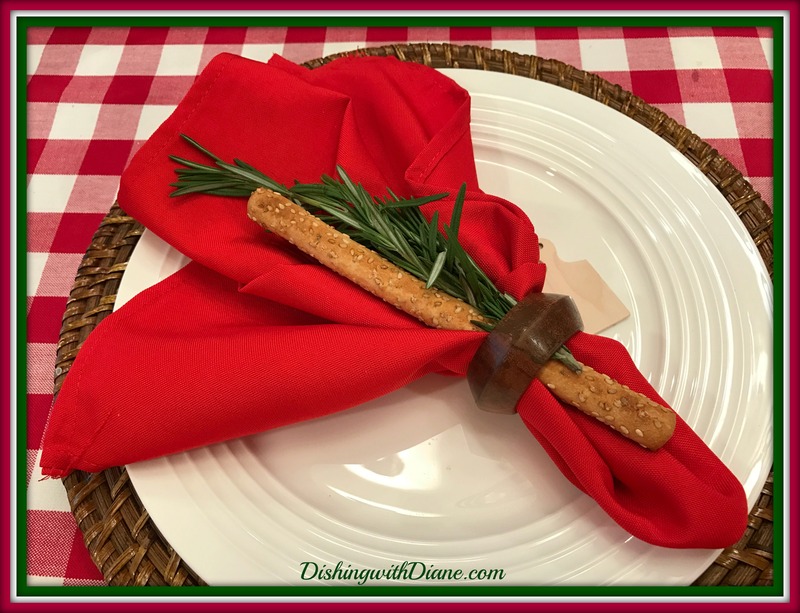 I placed a bread stick and a small branch of rosemary tucked inside each napkin ring just for a little fun. 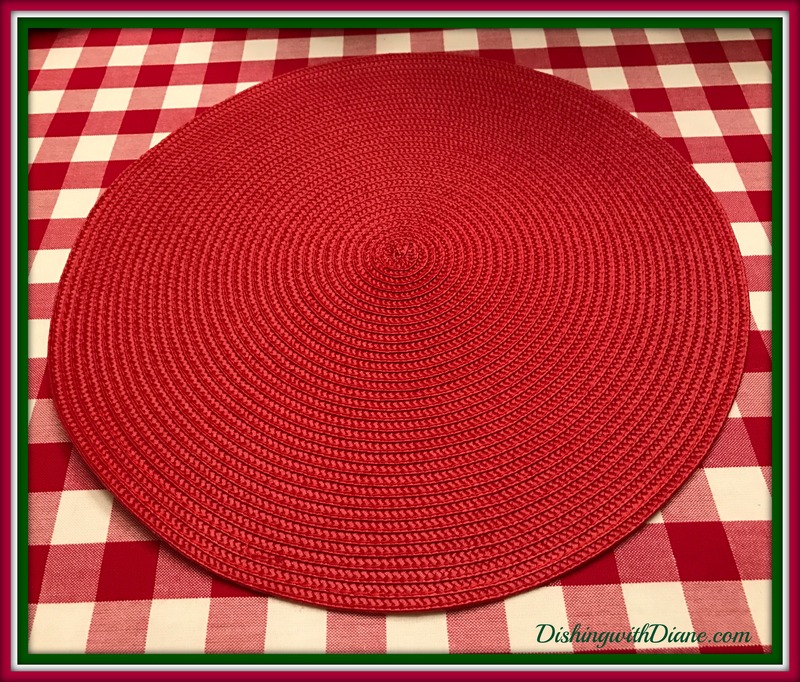 Before the charger plates, I started out with a red woven placemat. 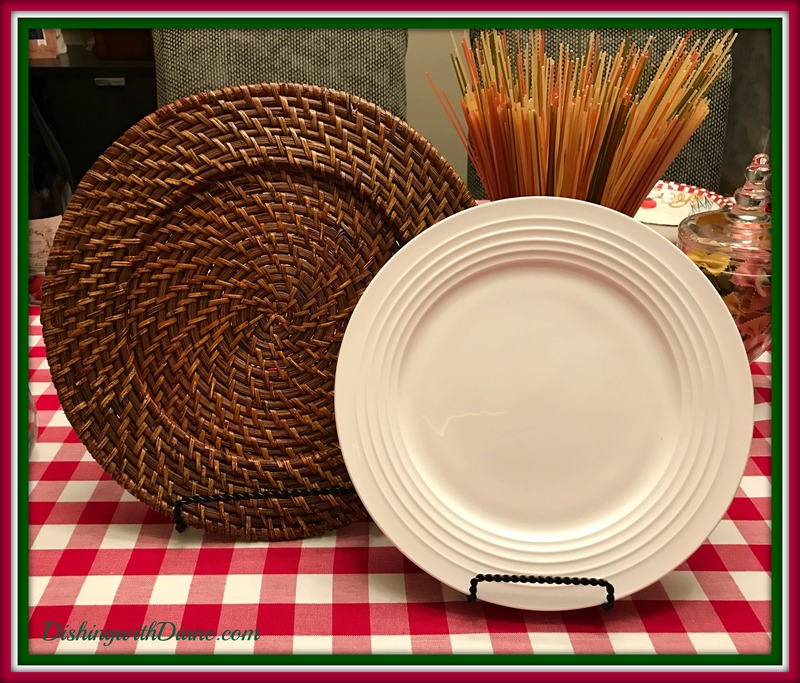 I took out my favorite brown rattan chargers and a simple white dinner plate to use as a base for the pasta bowls. The rattan charger coordinates with the wooden napkin ring. 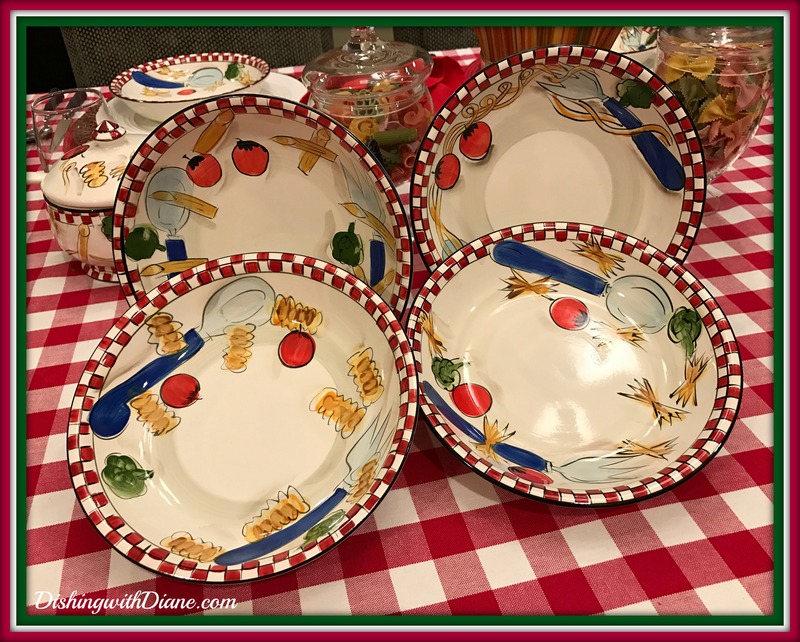 I have the perfect pasta bowls to use and they come from a pasta set that I bought from a Macy’s clearance table for $ 7.99 for the set of 4 pasta bowls, a large serving bowl, wooden serving utensils and a cheese server. I bought both sets they had. 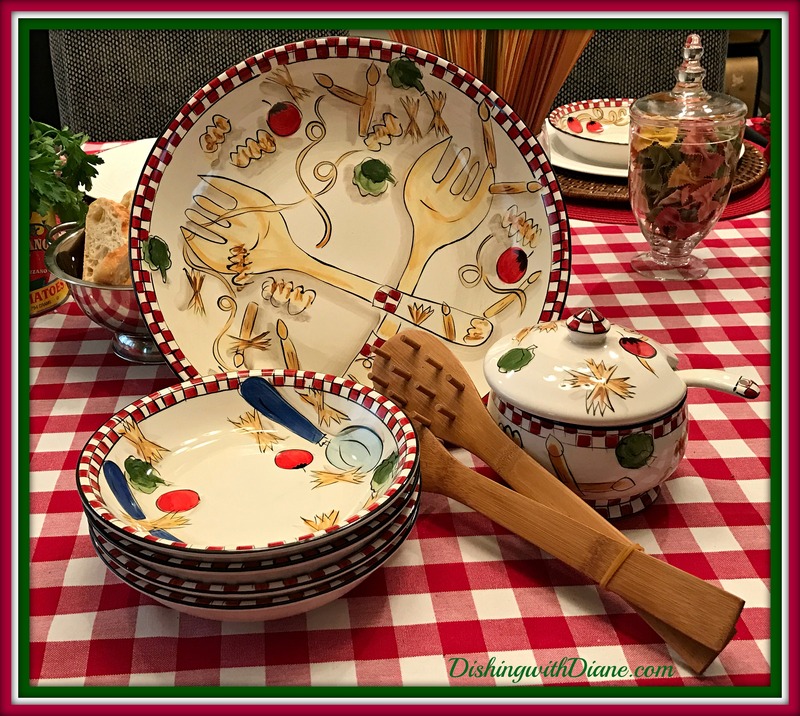 The bowls are white with hand painted designs of different pasta shapes and utensils in bright colors of yellow, red, blue and green with a check border of red, white and black. Not planned, but so happy that the border of the bowl matched the tablecloth. 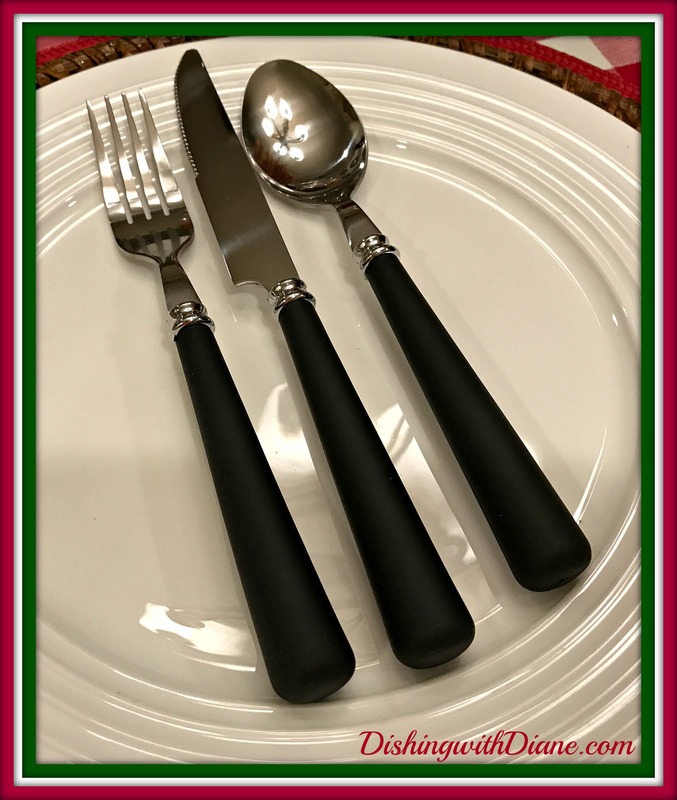 The flatware is black to take a color from the bowl and not make everything red and white. I needed some contrast against the tablecloth. I am using clear stemless wine glasses. A new purchase and I just love them. 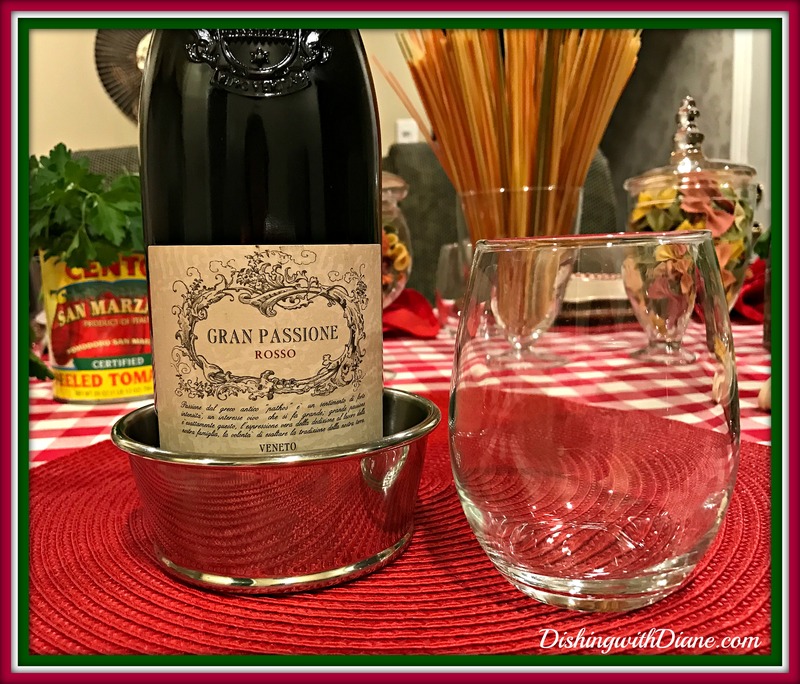 Perfect to use with one of our favorite red wines. 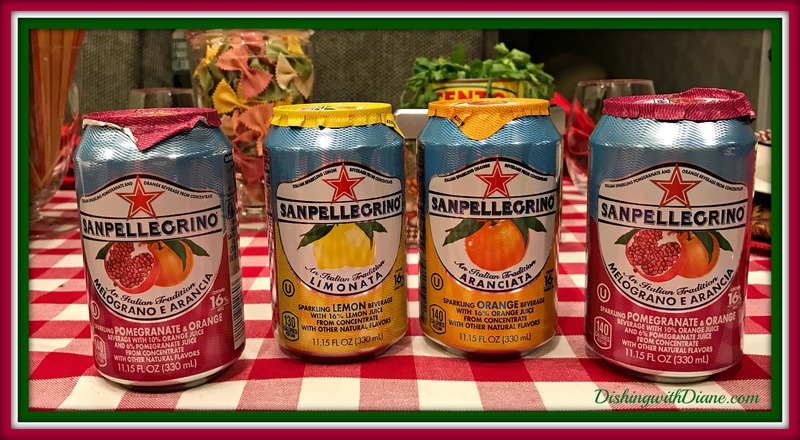 If my guests don’t care for wine, I have included some Italian soda. Now I need a centerpiece. No, it won’t be a Chianti bottle with a candle and all the wax drippings. 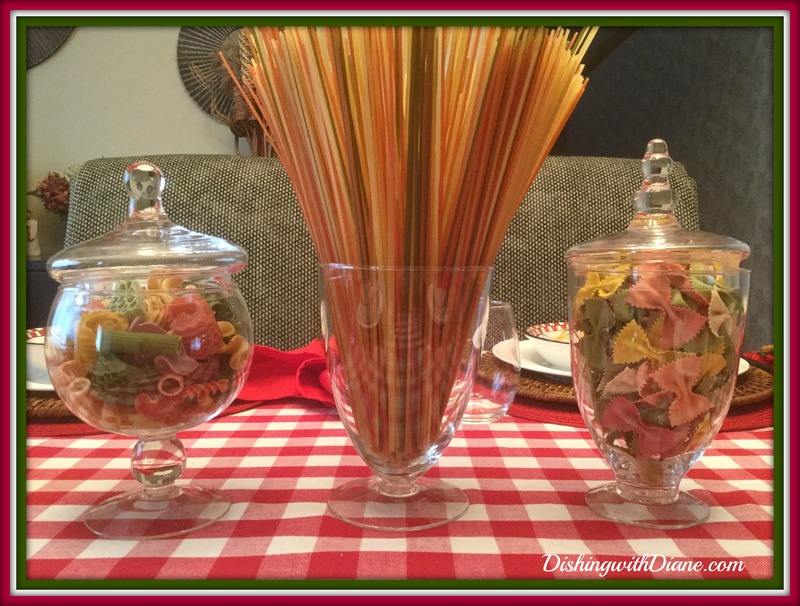 I didn’t want to order flowers for the centerpiece, so I decided to look around the house for an idea for an Italian theme tablescape. Not too far a stretch in my Italian home. I decided on a centerpiece made with macaroni. Remember, shop your home first for ideas !!! I have a variety of glass apothecary jars that would work perfectly; that I usually use for a candy bar when I serve a dessert table. And I have a lot of bags of macaroni in my pantry that I bought in Homegoods with beautiful colors and shapes. I am always picking up interesting food items in Homegoods. Next to gadgets, that is my favorite aisle. The centerpiece is coming together. 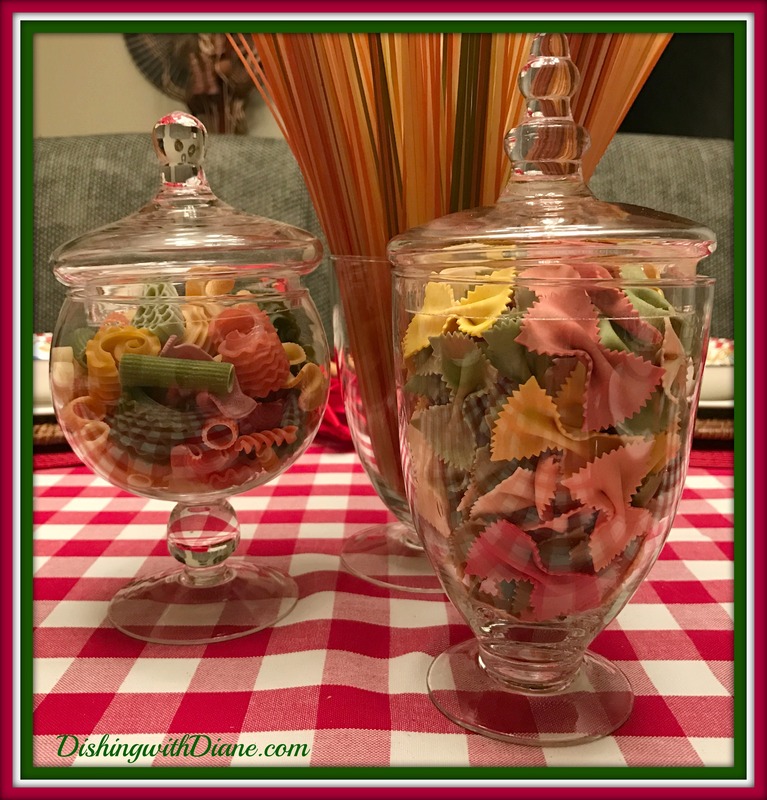 The jars with macaroni alone didn’t look finished to me, so to complete the centerpiece, I went back to looking around the kitchen. 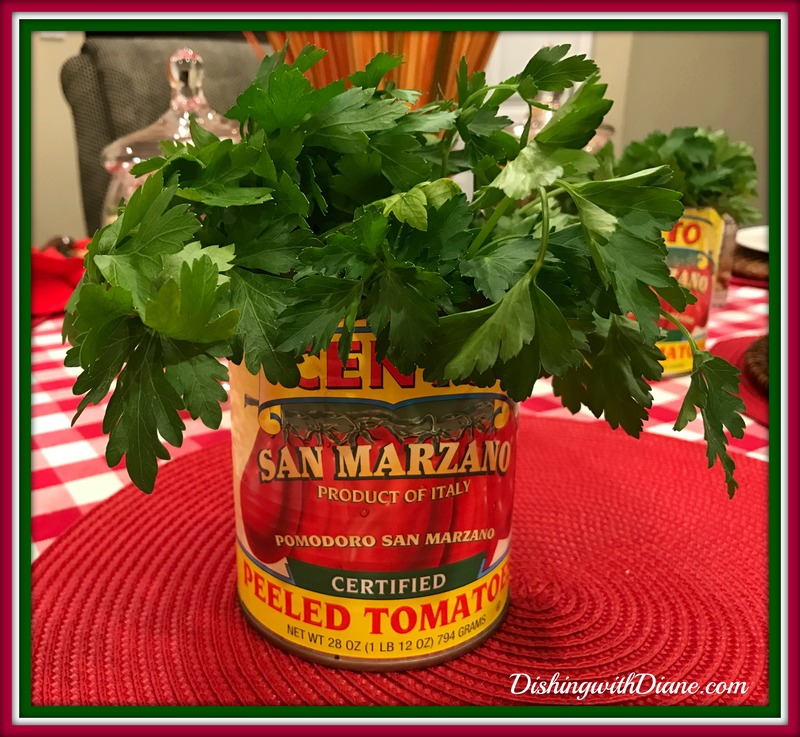 I decided to use two empty 28 oz cans from San Marzano tomatoes as vases filled with parsley; which I just happen to have in the kitchen. 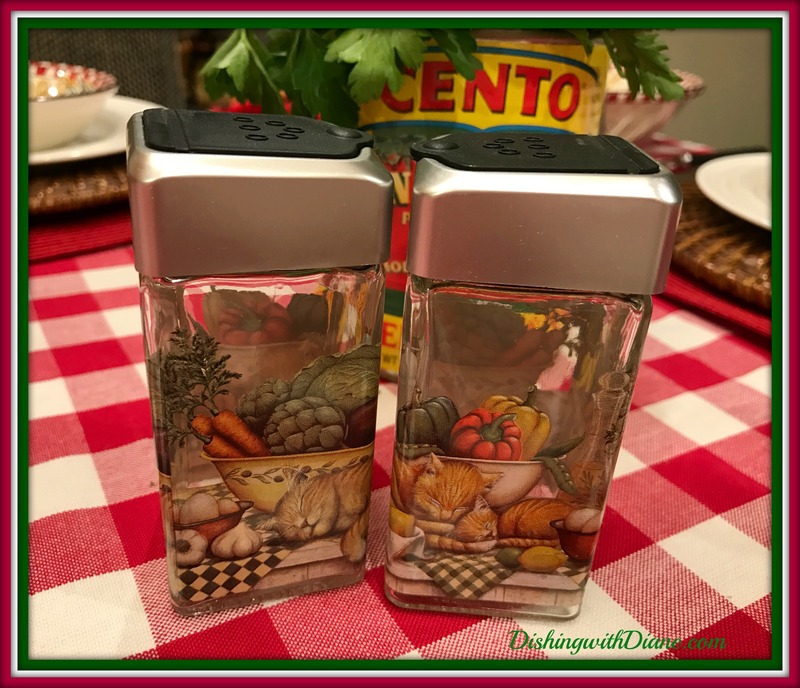 No Italian house is complete without parsley, basil, oregano, thyme, pepperoncino (red pepper flakes) and garlic. I found salt and pepper shakers to coordinate with the bowls a few months back on one of my midnight retail therapy sessions, so I added them to the table. The cheese server from the set is also on the table. 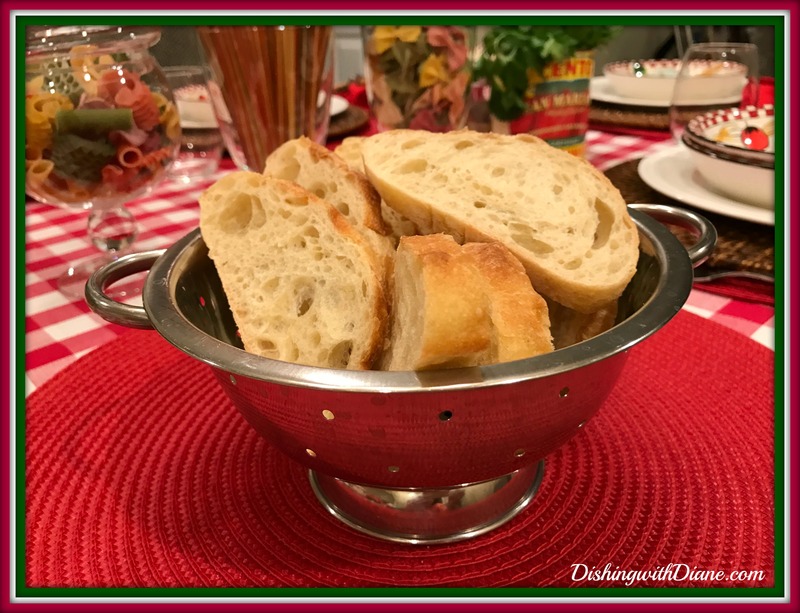 Mini colanders to serve sliced Italian bread. I love “mini” anything so I just had to buy a few of these colanders. They are great for washing fruit and today for holding bread. 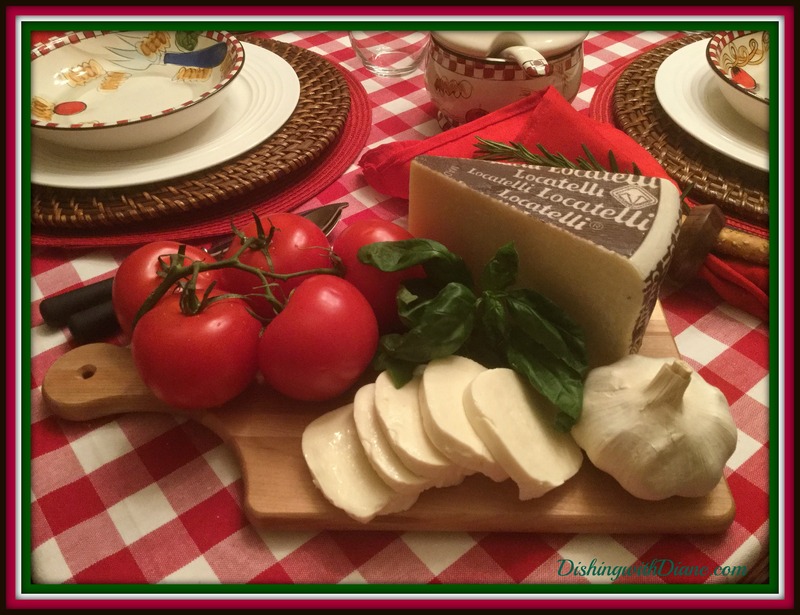 and a wooden serving board to display some fresh mozzarella, Locatelli cheese, tomatoes, garlic and basil; all components of this Italian meal. 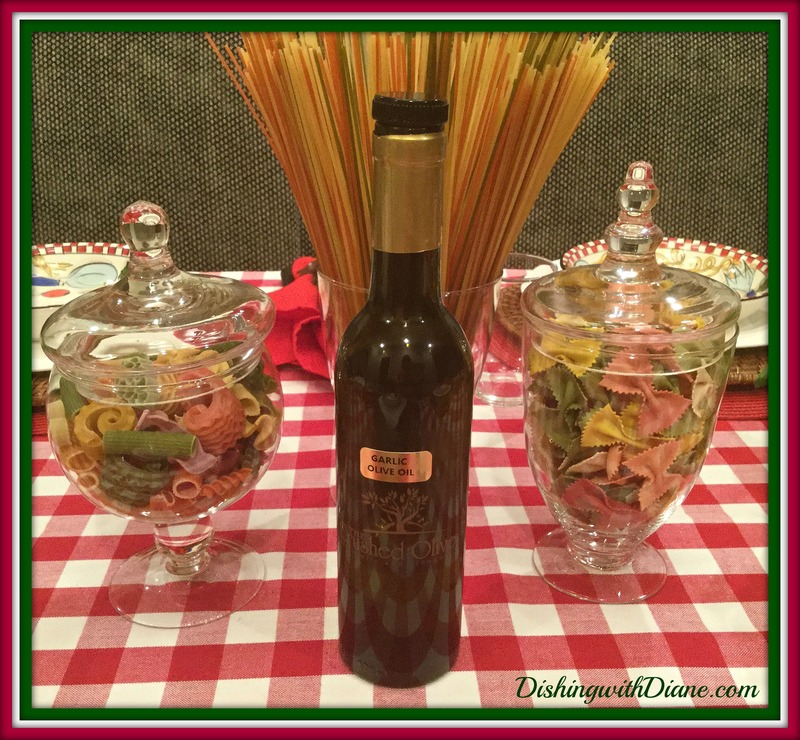 I served the baked rigatoni with a salad of romaine lettuce and some antipasti ingredients; marinated artichokes, olives, mozzarella, soppresata and tomatoes topped off with a mix of “garlic olive oil” from “The Crushed Olive”, and red wine vinegar for the dressing. The Crushed Olive is a specialty store that sells a variety of vinegar and oils. 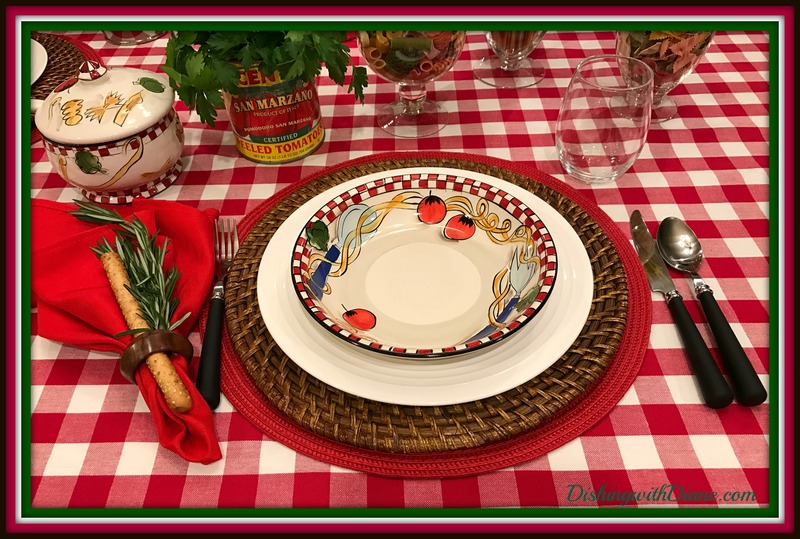 I made individual salad plates with a combination of the antipasto salad along with a traditional caprese salad (sliced tomatoes and sliced mozzarella with olive oil and oregano). The remainder of both salads were served on the table for second helpings. 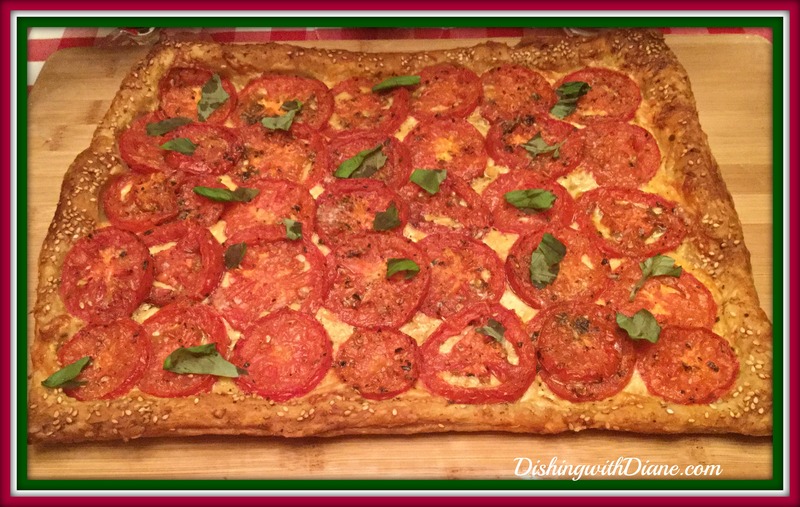 And last but not least, I made a tomato tart to serve with this meal. This is a recipe from Laura Vitale from The Cooking Channel and I love it and make it all the time. Out of the oven and ready to eat…so good. Now my craving for macaroni was over and I will continue to look for new recipes to share with all of you in the coming months. 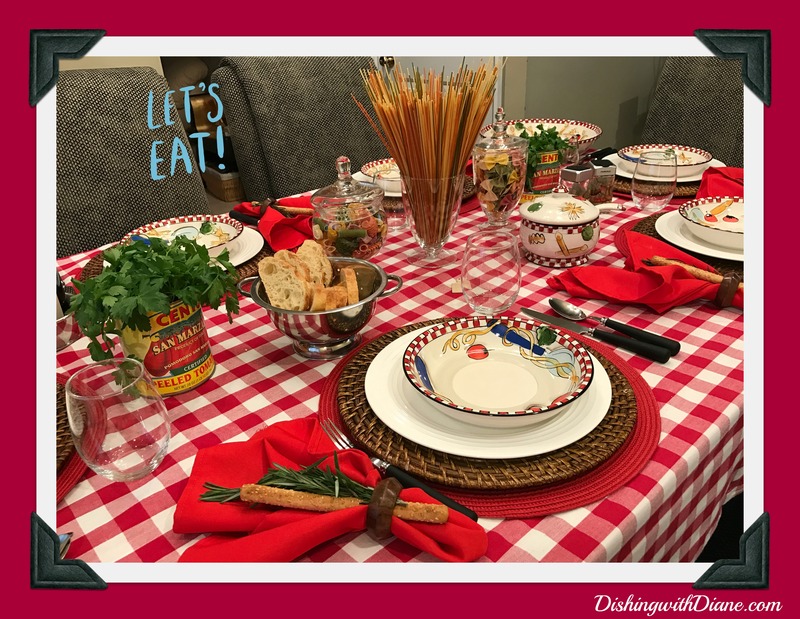 I hope you enjoyed sharing my comfort food tablescape with me and it gave you some ideas to set your table. Bring a large pot of water to a boil. Add the rigatoni, stir well and cook according to package directions. Drain the rigatoni, place in a large bowl and toss with a little olive oil to prevent sticking. Set aside. Add the meat and cook stirring to break up the meat, until no pink remains (approx 10 minutes). Drain off all of the fat. Add the parsley, oregano, Italian seasoning and tomatoes, tomato sauce and stir well. Stir in the cream, raise the heat and return to a boil. Remove from the heat and season with salt and pepper. Return the rigatoni to the pot and toss well. Oil the bottom of a shallow 3 qt baking dish. Spread half of the pasta mixture in the bottom of the dish. Sprinkle half the mozzarella. Top with the remaining pasta, the remaining mozzarella and all of the Parmesan cheese. Bake until the pasta is crusty and golden brown (approx 30 minutes). Remove from the oven, let stand for 5 minutes and serve. (Serves 6). Roll out the puff pastry so it’s 1/2 inch bigger on all sides. Transfer to the prepared baking sheet and use a fork to prick all over the pastry, leaving a 1/2-inch border all around. Scatter the fontina all over the pastry (leaving the border untouched) and set aside. In a large bowl, toss the tomatoes with the oil, Italian seasoning and some salt and pepper. 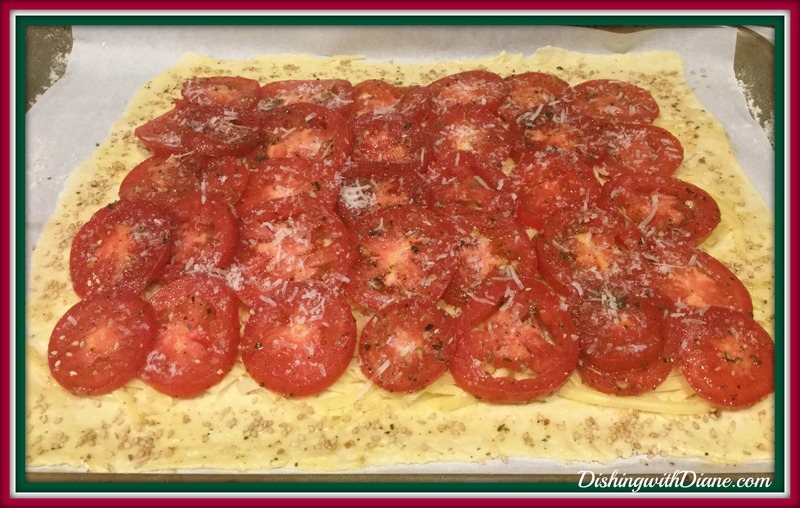 Arrange the tomatoes in a single layer (it’s ok if they overlap a little) over the crust–leaving the border–and sprinkle the Parmesan evenly over the top. Bake until the tart is deep golden brown and crispy, about 25 minutes. Let rest for 5 minutes. Tear the basil leaves, then sprinkle the basil over the tart before cutting it into squares. 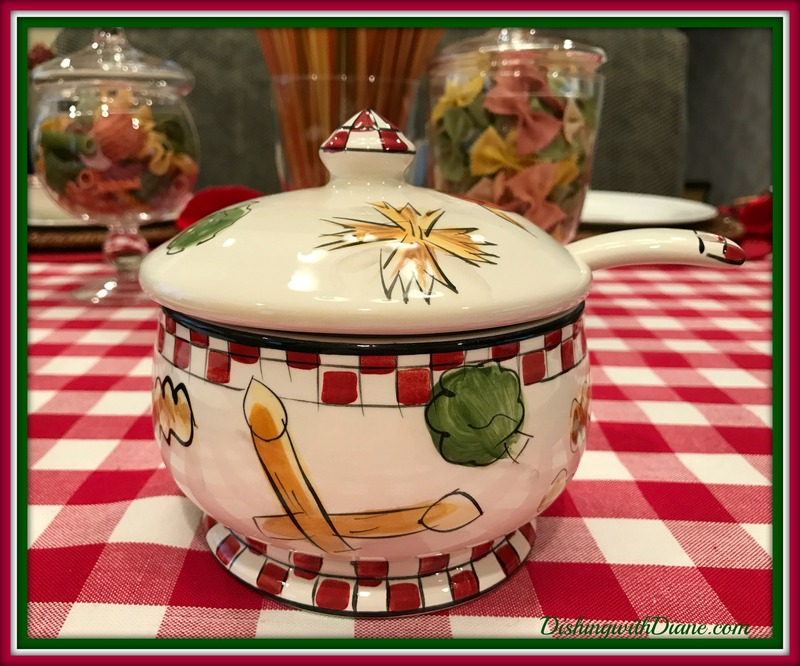 This entry was posted in All Occasion Tablescapes, Macaroni Dishes, Tarts on January 29, 2017 by aries041158. Love the tablescape. I felt like I was in little Italy. Dishes are lovely and the food looks delicious. 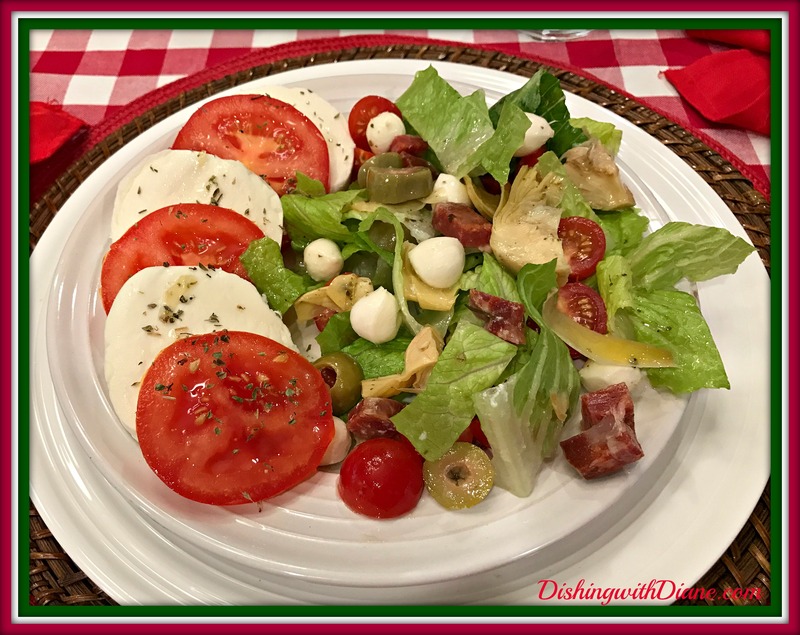 The antipasto salad had me thinking I have to make that for dinner tonite. Glad you liked the tablescape. I had a lot of fun with this one. Thanks for the inspiration! I would sit down to that beautiful table anytime! Buon appetito! 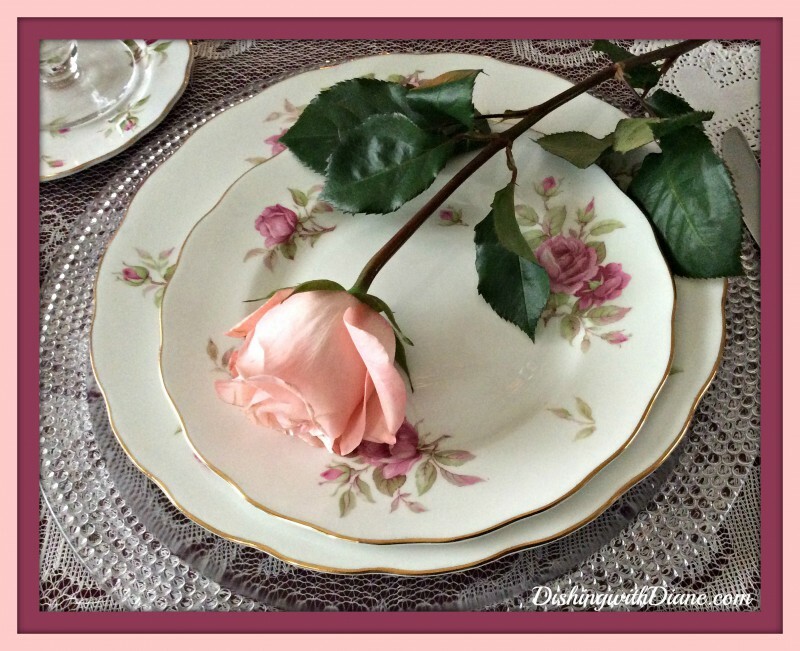 I am so happy that this post gave you inspiration for a tablescape of your own. That is the best compliment that I could receive. Thank you. Absolutely DARLING ! 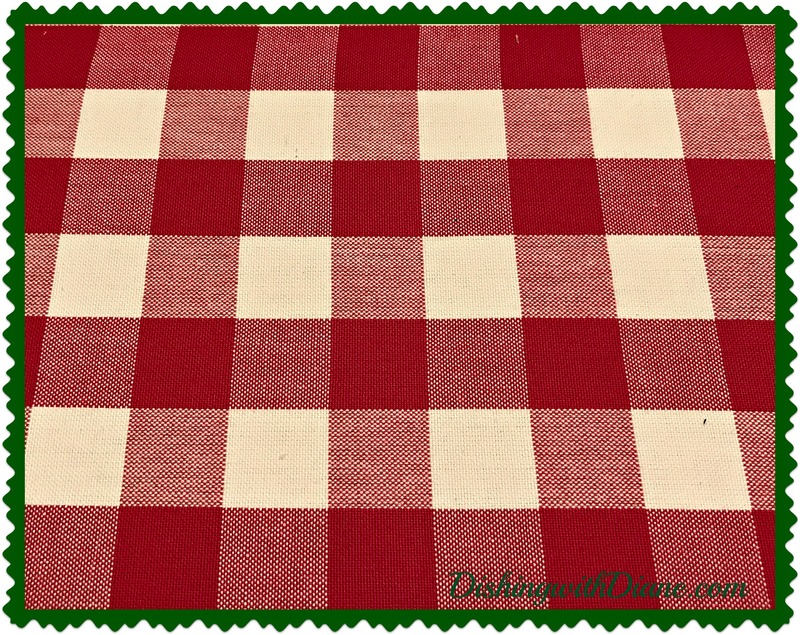 I have red and white gingham tablecloths and placemats all the time! Except for holiday decor!! LOVE ! lOVE ! 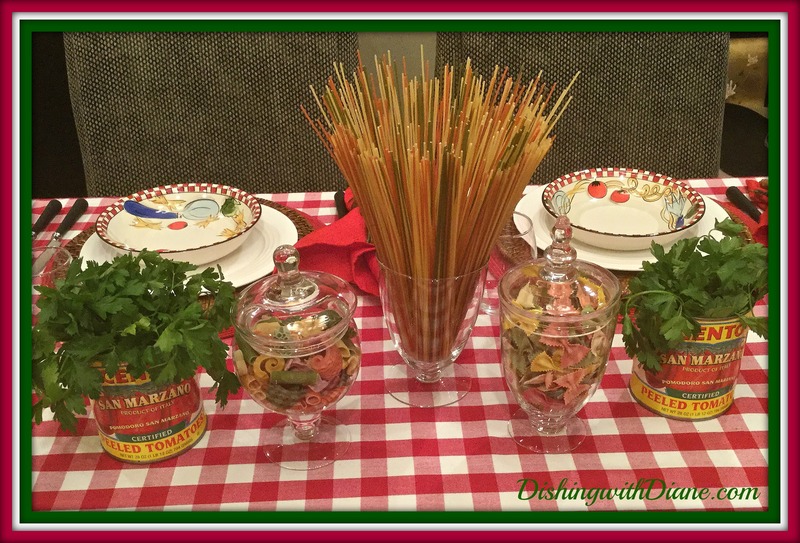 The spaghetti and jars of pasta and tomato cans with parley and adodorable dishes and a great menu! Wish I was at the table !! Ha! 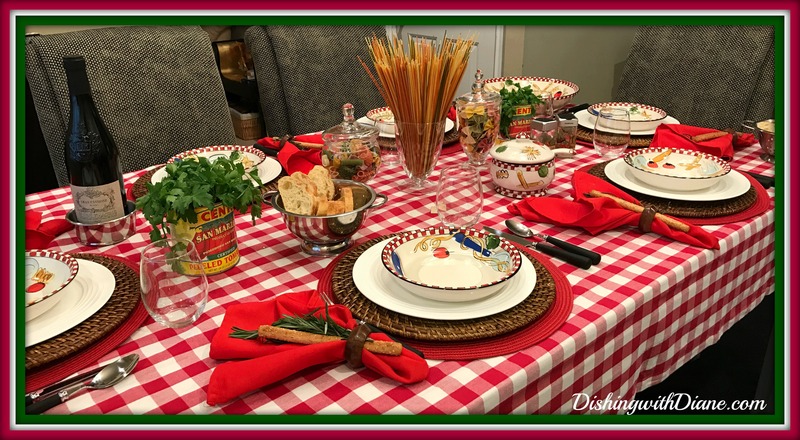 Going to use your decor ideas for Italian dinner party ! Thanks!! Love the table-scape, gorgeous!!! And the food, of course, is amazing!! Thank you. That was my big bargain for pasta sets. I had a lot of fun with that table.